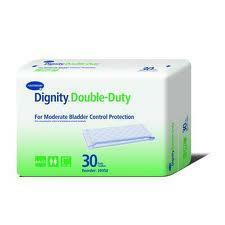 The CareGiver Partnership: If One Pad is Good, Two is Better...WRONG! Booster pads offer additional protection. At least once a week we get calls from customers who are wearing two pads inside their disposable pull-on, or are wearing two pair of disposable underwear at a time, or are wearing an incontinence pad inside their pull-on underwear. They are having leakage and want to know what to do. Pads and disposable pull-on underwear both have moisture barriers on the outside. We want them to, right? This stops the urine from leaking through to your cotton underwear and/or your clothes. But the moisture barrier also stops the urine from leaking into the second pad or second pair of disposable underwear as well. Let’s use a pad as an example. You place 2 pads (for incontinence), one on top of the other inside your underwear. Pad #1 fills up with liquid to its capacity and the most likely place for the additional fluid to overflow is on the sides which are in the leg area. Now you have wet underwear and possibly wet clothes. But very little if any of the liquid will be absorbed into Pad #2 because it is on the other side of the moisture barrier of Pad #1. The same is true if you wear 2 pairs of the pull-on underwear. Pull-on #1 fills up and then leaks out around the leg openings and onto your clothes or down your leg. Here is an easy solution that will save you money. You have the right idea to wear a pad inside of your disposable underwear but you need to wear the RIGHT pad. You need to wear a pad without the moisture barrier and these are called BOOSTER PADS. Booster Pads are made to be used with another absorbent product, a brief, a pull-on, a pad or a belted undergarment because the porous backsheet allows fluids to go through to the next protective level when full. Booster Pads have a flow-through design that allows the pad to fill to capacity with additional fluid passing to the pull-on. The BOOST PAD is economical to use, convenient to change and easy to dispose of. Booster Pads are perfect if you need an additional amount of protection than your pull-on/pad is giving you. Did you know that people buying incontinence products for the first time waste an average of $130 in trial and error mode trying to find out what will work best. That’s why we offer real help from real people at 800-985-1353 and a free and easy to use tool to help you quickly sort through over 660 incontinence products to determine which will best meet your needs. The tool is called the Incontinence Product Finder. We offer over 660 products choices and 11 different styles. Try our Sample Service to avoid wasting money on trial and error.